Leaps & Bounds Preschool believes that establishing positive experiences in education gives your child the opportunity to develop excellent foundation skills vital for success at school and in life. Our aim is to inspire and ignite a passion for learning in your child, so we encourage your child to ask questions, explore, imagine and investigate. Since children learn best by doing, they paint, make, create, sing, dance, dig, plant, water, imagine, tell stories, investigate, explore and get messy! Our program reflects spontaneous and planned experiences designed to support your child’s development. We see your child as a unique and capable individual, who comes to our preschool with their own interests, talents, skills and ideas. Our educators are very passionate and will truly value respect and appreciate your child’s uniqueness. Leaps & Bounds Preschool believes that your child has the right to be an active participant in their own learning journey and must be empowered to express their thoughts and ideas. We will endeavour to protect and cherish the innocence of your child and provide a learning environment for them the grow and blossom. Leaps & Bounds Preschool acknowledges that family is the most important and influential aspect in the life of your child. We embrace, encourage and reinforce the relationship between us, your child, your family and the broader community. We strive to develop a positive, mutually respectful relationship with each of your family members, as we work in partnership to achieve the best possible outcome for your child and your family. We believe that a working partnership with your family is key to ensuring continuity and progression in your child’s learning, development and future success. We invite families to participate in our preschool program at any time by sharing a talent, cooking, story telling or just spending time playing and interacting. We embrace diversity within Leaps & Bounds Preschool and the wider community so that your child has a sense of appreciation and wonder. Through respect, acknowledgement, appreciation and acceptance of diversity within our community, Leaps & Bounds Preschool embraces, celebrates and shares traditions and cultures throughout our program. We invite and encourage families and our educators to share their culture heritage and traditions with our preschool community. We incorporate a foreign language component into each preschool day through songs and games. Children gain a great deal of enjoyment, satisfaction and increased confidence as their foreign vocabulary expands. Language studied in 2018 is Mandarin. Leaps & Bounds Preschool provides your child with many opportunities to connect with the broader community. We have partnerships with many community organisations including Wesley Heights Nursing Home, bringing together children and senior citizens. This program is incredibly important for helping children develop relationships with people of all ages and helping children feel connected to their community. Both the children and resident’s experience so much joy from each visit. We utilise community resources to enhance the growth and development of your child. 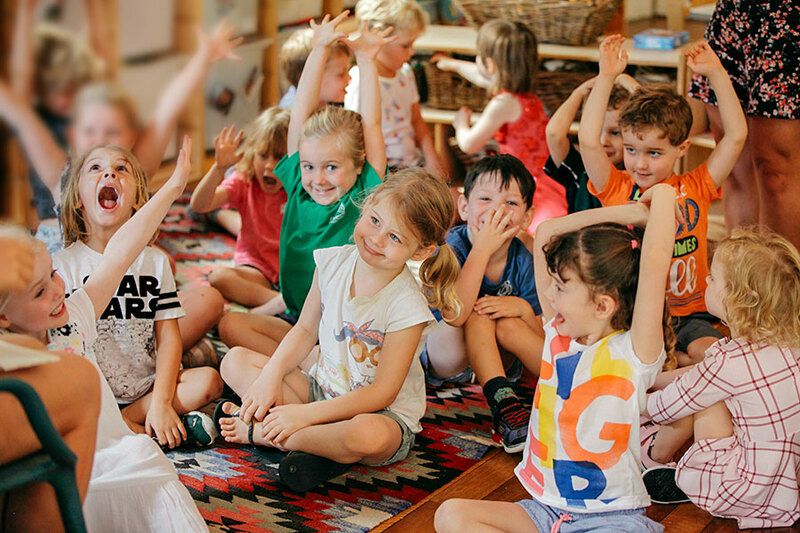 Each year we invite the police, fire department, penguin and environmental officers plus many more into our preschool to share their knowledge and experience with your child. Leaps & Bounds Preschool emphasises the importance of giving back to those less fortunate. We hold fundraising events for various not for profit organisations and volunteer groups. Organisations that have benefited from our fabulous fundraising team are The Cancer Council, ZimKids, Farmer Drought Relief, Children's Cancers plus many more. Leaps & Bounds Preschool outdoor environment is large and amazing! Children have open space to run, climb, jump, explore and even play soccer! The outdoor space is inviting, full of trees and plants, herb and vegetable gardens, a climbing fort, a sand pit and a mud kitchen. Children have an inherent connection to the natural world and we understand that children often develop their ideas and understanding of the world around them from the significant adults in their lives. As Leaps and Bounds Preschool represent one of these significant adults, we have a responsibility to present a positive approach to the environment. Our learning environments have large and interesting outdoor spaces and inviting areas that reflect and enrich the lives and identities of children and families participating in the setting. The materials we use have a purpose to capture attention and promote productive learning. Our materials are made from natural products and are suitable for all skill levels. Eye catching themed displays of our materials are refreshed frequently and are uniquely developed to be a safe and hands on experience. Both my children love attending Leaps and Bounds Preschool. Throughout their time at the Preschool they have established good friendships with other children and carers. The student groups form quite a little team and my youngest can name everyone in her class by first and last name. Furthermore, the programs delivered give students the opportunity to learn new skills and ideas as well as play and explore the natural environment. My children particularly love getting involved in the garden. I really like the student lead learning that is so evident in everyday activities and lessons.